Ambassador Abdul Momin passed away on August 11, at the age of 86. With his death, the country has lost an astute diplomat, a perfect gentleman and, above all, a valiant freedom fighter. Momin was one of three Bangali ambassadors who had declared allegiance to Bangladesh during our War of Liberation. At that time, he was serving as Pakistan's ambassador to Argentina. The other two ambassadors were Abul Fateh and late Khurram Khan Panni, who were posted in Baghdad and Manila, respectively. The provisional government in Mujibnagar gave him a special assignment to create international opinion in favour of our independence movement. In that capacity, he visited a number of countries and worked tirelessly for the cause of our country. The nation will remember his valuable contributions at that critical juncture with deep appreciation and gratitude. Ambassador Momin came from an illustrious family of Feni. His elder brother Abdur Rashid was a member of the Civil Service of Pakistan (CSP) and rose to the rank of secretary to the then central government of Pakistan. Rashid's two sons Dr. Harunur Rashid and Mamunur Rashid had joined the CSP and played major roles during our independence war. Momin's younger brother Abdur Razzak was a member of the Pakistan Foreign Service (PFS), but he left the service and settled in Sweden. In 1971, he came out of his private life to promote our cause. He also served as Bangladesh envoy to Sweden. Ambassador Momin had initially joined the Bengal Civil Service in 1946 and was absorbed in the PFS in 1950. In addition to Buenos Aires, he served in Pakistani missions in Rangoon, Washington DC, Baghdad, Shillong and Brussels. After independence he was given special assignment as secretary (administration) to create the organizational framework of the Foreign Ministry of independent Bangladesh. Later, as the special envoy of our prime minister, he visited a number of countries to seek recognition of our newly independent country. He played a major role in the establishment of diplomatic ties with South American countries. Thereafter, he served as Bangladesh's first high commissioner to Canada, then as the first ambassador to the People's Republic of China and, finally, as our envoy to France. During my career as a foreign service officer, I had various opportunities to interact with this great freedom fighter and astute diplomat. I had the privilege of meeting ambassador Momin for the first time in Islamabad, at the Pakistan Foreign Ministry in 1969, when I was assigned there for on-the-job training. At that time, he was in charge of the South American division in the ministry, and my probationer colleagues and I were able to gain much from his vast and varied experience. He was kind, soft spoken, and a strict disciplinarian, always immaculately dressed, suave and elegant. I met him in Ottawa in 1973 when I had gone there for a visit from Washington DC, where I was a second secretary at the Bangladesh Embassy. Ambassador and Begum Momin invited my wife Tuhfa and me to a lunch at his residence. With examples from his own life, he gave us so many tips for our diplomatic life. I met him for the last time about a year ago, when he had come to the Retired Ambassadors Group's get-together. One could see that he was in failing health and yet he was in full spirit. He talked with all of us and enquired about our welfare. At his namaz-e-janaza, I remembered the quiet contributions of this great man to our nation. I pay my homage to this eminent freedom fighter, express my deep condolences to Begum Momin and members of the bereaved family at their irreparable loss, and pray to Allah to grant eternal peace to his soul. 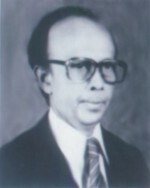 Syed Muazzem Ali is a former Foreign Secretary of Bangladesh.